The Great Countess Matilde (1046-1115) is the most important historical figure of the TEA Park, and is renowned for being the most prominent and interesting female character of the Italian Medieval period. The noble Canossa family with Lombard roots descended from Adalberto Atto in Lucca, but settled in the area of Reggio Emilia in the 10th century. Matilde lived an unusual life for a woman during Medieval times. Before she came into power, she lived through independence and conviction. Matilde's father was assassinated in 1052 along with her brother and sister, leaving Matilde as the surviving heir to inherit her family's estate. Matilde's kingdom reached significant size ranging from Lombardy to the border of the Papal States and embraced the territories of the Tuscan-Emilian Apennine National Park. She supported the authority of the Pope during a time when there was conflict between secular and religious powers in Medieval Europe, and she hosted the penance of Henry IV, the Roman Emperor before Pope Gregory VII in the Castle of Canossa. The Countess expanded her estate and improved living conditions in the Park by constructing churches, cathedrals, hostels for travellers. homes for the poor, and sponsored the growth of chestnut tree orchards. Her kingdom was the last moment in history when the Park territory was united in just one county. Today, her contributions to society and to history are visible and can bee seen as castles, parish churches, and tower-houses throughout the Park.. The Countess is buried in a tomb that was hand-carved by Gianlorenzo Bernini in St. Peter's Basilica in Rome. Dante Alighieri (1265 – 1321) is one of the most notable figures in Italian literature, he wrote the epic poem the Divine Comedy and was a major contributor to the birth of Italian language. Due to the political situation in Italy at the time, Dante spent most of his life in exile, travelling around Italy while writing his most celebrated poem, the Divine Comedy. During his travels, he visited Pietra di Bismantova in the Park and was so impressed by it that it inspired the mountain of Purgatorio in the Divine Comedy and is also mentioned in Canto IV. Ludovico Ariosto (1474 –1533) was an Italian poet and the author of the romance epic Orlando Furioso (1516), one of the most famous poems in the Italian Renaissance. 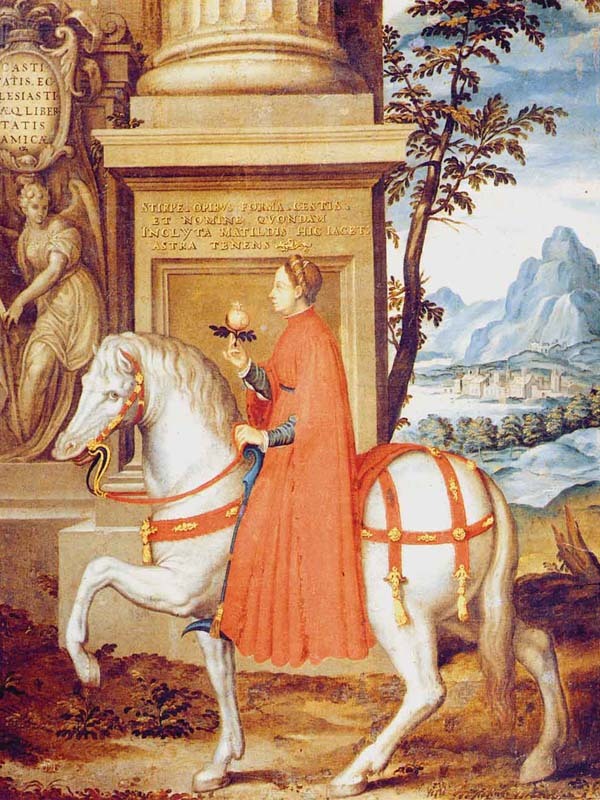 Ludovico worked for the Duke of Ferrara as a diplomat and because of the war, he was appointed to the province of Garfagnana and had to spend several years there. He wrote several poems and letters about Garfagnana, describing it as a place of factions and bandits. One of his stories was about a time when he was walking alone in Garfagnana and fell into the company of a group of bandits. When the leader of the bandits discovered that his captive was the author of Orlando Furioso, he apologized for not having immediately shown him the respect due his rank.